Father’s day is approaching and I’m usually good with gifts. But come father’s day I just don’t really know. And I don’t know about you, but my dad is superrrr hard to buy for. Especially when it’s just a ‘token’ gift. Whenever you ask him if he needs/wants anything you’re greeted with a series of ‘ummm I don’t know’. Bless him. 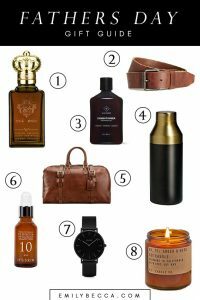 But anyway, to save you the constant questions and endless searches online, here is my Father’s day gift guide for the last minute, luxury and the laid back! Fragrances are such a no-brainer gift in my opinion. Who doesn’t love to spritz themselves from time to time? And I swear having perfume/aftershave can make you feel like a million bucks. And there’s so many to choose from! My personal pick is the Clive Christian scents, from single scents to gift sets it makes for the perfect Father’s Day Luxury Gift. From everyday scents to more luxe scents you can’t loose! Not everyone drinks alcohol, but I think we all enjoy a little something something. Even if it isn’t alcoholic. And what’s better than having your own little drinking glass or bar accessories. You can get a lot of cool unique glasses and decanters or even personalised ones! Or even some bar accessories if that’s their thing. Accessories such as watches, wallets or bags are a great gift. They’re super useful and your dad probably won’t think about buying them. Me and my brother have alternated with buying my dad a new wallet throughout the years as he will use his until the very end. But you could also get him a tie, cuff-links, a new phone case or maybe a belt or a new bag. Give your dad a little accessory refresh. Even you’re dad likes a nice pamper evening. And some relaxing time. So treat him to some nice skincare or bath products to make him feel fresh and new! Or maybe a nice candle to go along side. You could even create a nice little washkit of bits for them. Again it can be one of those things people neglect to buy but will definitely appreciate. I asked my dad’s opinion on this one. He said he’d like it, but there would definitely be dads out there who probably wouldn’t have too much use. But I want to pop it on the list anyone as I personally love a good notebook and as does my dad. If you’re on a budget or a bit stuck for ideas this might be an idea for you! My dad’s a huge bookworm. And I’m sure many other dads are too! But maybe give some light reading with a twist. Add a little comical twist or have it more of a hobby-related read. If you look on shops such as Urban Outfitters you can find some great and quirky books which are bound to make your dad chuckle! So here are some father’s day ideas! For the last minute, the luxury or the laid back. What are you treating your dad to this father’s day? This is a paid collaboration. All opinions are my own. Great post – these are some nice ideas! For me, buying my dad a Father’s Day gift stinks because his birthday is pretty close to that day… I like to spoil him for his birthday but then it seems like there is nothing to buy him for Father’s Day! 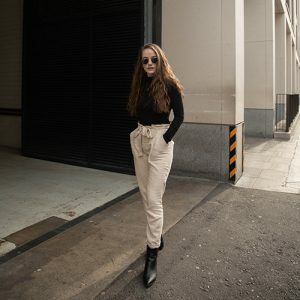 🙂 This post will be a great help! A watch is such a good idea! Practical, stylish and not too expensive! Thanks for sharing these great ideas! Also, who’s dad doesn’t enjoy a little tipple every now and then! Aww thank you! Ahahaha exactly! Thanks for sharing these. I never know what to get the men in my life. You’re welcome! Neither do I haha! For Father’s Day, we are actually going to buy my dad a really nice portable stadium seat. He is always watching the grand kids play sports and thought this would be convenient for him and comfy = ) Fragrances are always a big hit with my dad too! Thanks for sharing!! What a great post! Guys are always so difficult to shop for so this definitely helped me out! Thanks so much! shopping for dad can always be a challenge, but I love these ideas!